Find My Workspace lists over 95% of the executive office suites market in Livingston (NJ). Simply click Request Quote to check pricing for one office, or Add to Basket for multiple offices. Work out of a fantastic and highly professional business environment with a range of other corporate occupants including startups, freelancers, and entrepreneurs. 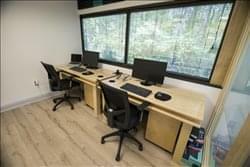 This is an amazing, ground floor office space located in the center of Livingston NJ. It is fully furnished with a modern design and lots of sunlight. There is also fantastic access to a shared conference room, a cafe, a health club and fitness center and secure on-site open parking spaces, outdoor picnic tables, printer, in office refrigerator and a community of like minded people. There is all-inclusive, month to month pricing available.